Three of the five heroines (yes, that’s right…five; because I like really heroines) in my debut novel Fanny Newcomb and the Irish Channel Ripper live in the imaginary Wisdom Hall settlement house in 1889 New Orleans. But—I was asked recently at a book club meeting—what’s a settlement house? Glad you asked, because if you don’t know what a settlement house is, then you probably don’t know about the pantheon of settlement house heroines. And let me tell you, those women were focused, fierce, and effective. The settlement house idea took root in 1884 when a London clergyman, his wife, and a group of male college students decided to fight poverty by teaching the poor while living in their neighborhood. The college men settled into a vacant house in lower-class Whitechapel, created a resident teaching community, and christened their endeavor Toynbee Hall. As news of Toynbee Hall’s educational mission was publicized in the London newspapers, inquisitive visitors from America began arriving at the doorstep. In 1888, twenty-eight-year-old heiress Jane Addams—a graduate of the Rockford Female Seminary in Illinois—was one of those curious visitors. A year later Jane Addams and her partner Ellen Gates Starr organized their resources, refined their vision of social justice and reform, and co-founded their own settlement house: Hull House in Chicago. 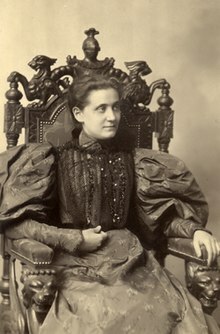 Jane Addams as a young woman. Undated studio portrait by Cox, Chicago. Hull House initially served Chicago’s impoverished and competitive German, Jewish, Italian, and Greek immigrants by providing classes in English and hosting concerts and educational lectures. Eventually, Hull House residents built a public playground and gymnasium, offered kindergarten classes, and ran a public medical dispensary. Hull House services immediately improved the lives of their immigrant neighbors by easing their integration into their new country. Although Hull House’s activities seem commonplace today, Jane Addams and her team of women workers provided revolutionary opportunities to improve the living conditions for thousands of people. In addition, the women who lived and worked at Hull House—women like Charlotte Perkins Gilman (author of “The Yellow Wallpaper), Florence Kelley (future leader of the National Consumers League), and Frances Perkins (FDR’s Secretary of Labor)— benefited greatly from the experience. As part of the new resident community, these women workers had the opportunity to learn new leadership skills, launch social research projects, and fight for reform. Heroic skills indeed! Within a few years, other educated and enthusiastic American women (and men) opened social settlements in their own cities, such as Henry Street Settlement in New York City and Denison House in Boston. I was introduced to Jane Addams as a history student at Florida State University and was immediately attracted to her compassion for her immigrant community, drive to get the work done, and her inspirational and leadership abilities. And then I began to wonder…since the late 19th century south had a significantly different culture and attitude than the north, did the south ever have a heroine like Jane Addams? Did the south have any settlement houses? Because the settlement house movement was an urban movement, I sought my answer in New Orleans (Gilded Age population: 250,000 souls). And there I found Kingsley House. Kingsley House—or Kingsley Mission House as it was also known—was located in the very heart of the city’s factory district on Tchoupitouias Street…. [It] has a Girls’ Club, a Boys’ Club and a junior club. Its members are factory boys and girls and the little children of laborers, artisans and mechanics. But by 1901 Eleanor McMain—trained at New Orleans’ Free Kindergarten Association and mentored by Jane Addams—was appointed director of Kingsley House. Following the Hull House model, McMain provided her immigrant neighbors with a kindergarten, medical clinic, library, and adult night school. She also ensured that the services were offered on a non-sectarian basis. Eleanor McMain would run and expand Kingsley House outreach for until her death in 1934. My research into Kingsley House and Eleanor McMain was so exciting that I just had to write about them, initially for my master’s thesis and later as historical fiction. How could I resist the lure of these types of characters and conflicts? Upper class, well-educated young women living and working in a lower-class neighborhood; the fear, resentment, and competition between immigrant groups; not to mention an urban environment rife with greed, corruption, and cronyism. And finally—since Jane Addams had visited Toynbee Hall just a few months before Jack the Ripper’s murderous rampage on Whitechapel—there was always the possibility of a Jack the Ripper copycat. My great hope is that as Fanny Newcomb, Sylvia Giddings, and Dr. Olive Giddings—my fictional settlement house heroines—track down a vicious Jack the Ripper copycat in Gilded Age New Orleans, they are as focused, fierce, and effective as their real-life settlement house heroine inspirations—Jane Addams, Ellen Gates Starr, and Eleanor McMain. 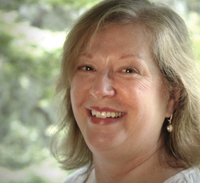 Ana explored the historic houses and landscapes of Virginia as a teenager, earned her master’s degree in American history from Florida State University, and traveled her way through Mississippi as an architectural historian. She also spent one very long, hot summer in New Orleans researching content for her master’s thesis.